Photo courtesy of Pal's Sudden Service. A privately owned, quick-service restaurant chain, Pal's Sudden Service serves primarily drive-through customers at 17 locations, all within 60 miles of Kingsport, Tenn., where its first restaurant opened in 1956. Carefully following its formula for standardizing high levels of product and service quality, Pal's has since grown to become a major regional competitor. Today, Pal's employs about 465 people, 95 percent of whom are in direct production and service roles. It competes directly with national fast-food chains, earning a steadily increasing--and, now, second-best-in-its-region--market share of almost 19 percent, doubling since 1994. In 2001, sales totaled about $17 million. Featuring hard-to-miss exteriors festooned with larger-than-life menu items, Pal's restaurants sell hamburgers, hot dogs, chipped ham, chicken, French fries, and beverages as well as breakfast biscuits with country ham, sausage, and gravy. The company aims to distinguish itself from fast-food competitors by offering competitively priced food of consistently high quality, delivered rapidly, cheerfully, and without error. The majority of customers live or work within three miles of Pal's locations, and nearly two-thirds are women. Pal's is the first business in the restaurant industry to receive a Malcolm Baldrige National Quality Award. Customer scores for quality in 2001 averaged 95.8 percent, as compared with 84.1 percent for best competitor. Pal's order handout speed has improved by over 30 percent since 1995, decreasing from 31 seconds to 20 seconds, compared to its competitors' performance, which increased from 73 seconds to 76 seconds over the same period of time. Even in the current economic situation, with substantially decreased sales and profits throughout the hospitality industry, Pal's sales continue to increase. Pal's Business Excellence Process spans all business operations from strategic planning to on-line quality control. Every component process, including those for continual improvement and product introduction, is interactively linked, producing data that directly or indirectly inform the others. For everything organizational and operational, Pal's has a process. And almost nothing--from new product introductions to hiring decisions to the design of support processes and work systems--is done without thorough understanding of likely impacts on customer satisfaction. The company's Business Excellence Process is the key integrating element, a management approach to ensuring that customer requirements are met in every transaction, today and in the future. Carried out under the leadership of Pal's two top executives and its 17 store owner/operators, the Business Excellence Process spans all facets of the operation--from strategic planning (done annually with two-year horizons) to on-line quality control. Every component process, including those for continual improvement and product introduction, is interactively linked, producing data that directly or indirectly inform the others. Benchmarking underpins the entire Business Excellence Process. Managers are continually on the lookout for benchmarking candidates, and each one compiles a running list of potential subjects. For the Leadership Team, benchmarking yields meaningful competitive comparisons, new best practices for achieving higher performance goals, or new organizational directions. For the entire organization, benchmarking results are a constant reminder that performance always can be improved. Pal's is exhaustive in its pursuit of useful data, the basis for sound planning and decision making. In particular, customer, employee, and supplier feedback is central to all processes, and it is gathered in numerous formal and informal ways. For example, Pal's owner/operators must devote part of every work day to "marketing by wandering around." A portion of this period is spent engaging employees and customers to hear their views on how a location is performing and to solicit ideas for improvement. Owner/operators also go door-to-door within a 3-mile radius of their restaurants, seeking direct input on customer requirements and satisfaction levels. Answers to predesigned questions are recorded, compiled, and later analyzed at the store and corporate levels. Owner/operators also maintain a communications log. They record what they have learned about sales, expenses, customers, staff, products, services, equipment, and suppliers, and they list ideas for improvement. Weekly logs are sent to senior Pal's executives, who comb the entries for issues and opportunities to be addressed at formal monthly management reviews of organizational and business results. Data are gathered systematically at all levels--process, shift, individual store, and entire business. The company's enterprise resource planning system, SysDine, is a key tool, generating store-level and company-wide data on sales, customer count, product mix, ideal food and material cost, and turnover rates. This information supports daily operational decisions. It also is used to update Pal's Balanced Scorecard of Core Performance Measures, which links directly to its key business drivers: quality, service, cleanliness, value, people, and speed. Managers regularly review the value of the data collected, and the company employs an outside statistician to evaluate the type of information tracked, how it is used, and how it is collected. Pal's aims to provide the "quickest, friendliest, most accurate service available." Achieving this objective is a real challenge in an industry with annual employee turnover rates of more than 200 percent. The company's success in reducing turnover among front-line production and service personnel, most of whom are between the ages of 16 and 32, has translated into a competitive advantage. Since 1995, the turnover rate at Pal's has decreased from nearly 200 percent to 127 percent in 2000, and it continues to fall. In comparison, the best competitor's turnover rate in 2000 topped 300 percent. Moreover, since 1998, sales per labor hour at Pal's improved by about $6. Developed with the aid of benchmarking studies, the company's training processes support improvement in operational and business performance. Owner/operators and assistant managers have primary responsibility for staff training. They use a four-step model: show, do it, evaluate, and perform again. Employees must demonstrate 100 percent competence before they are certified to work at a specific work station. culture is required for new staff at all facilities via computer-based training, flash cards, and one-on-one coaching. Cross-training is required of all store-level staff to ensure their complete understanding of all production and service procedures as well as quality standards. Recognizing that most of its front-line workers are first-time entrants into the labor force, Pal's management believes it has responsibility to help its workers develop knowledge and skills that can be applied in future jobs. 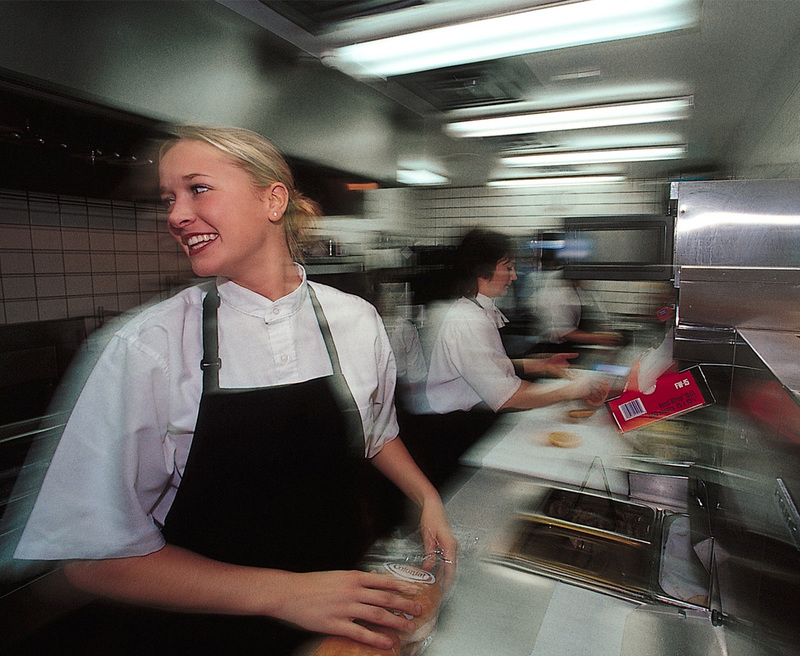 This approach, along with competitive wages and financial incentives, has made the restaurant chain a desirable place to work for high school and college students. Pal's has leveraged its reputation by implementing a statistically controlled, talent-based hiring system that helps managers identify applicants with attributes associated with effective job performance and customer satisfaction. In customer satisfaction, including food quality, service, and order accuracy, Pal's is outperforming its primary competitor. For example, customer scores for quality in 2001 averaged 95.8 percent, as compared with 84.1 percent for its best competitor. Pal's order handout speed has improved more than 30 percent since 1995, decreasing from 31 seconds to 20 seconds, almost four times faster than its top competitor. Errors in orders are rare, averaging less than one for every 2,000 transactions. The company aims to reduce its error rate to one in every 5,000 transactions. In addition, Pal's has consistently received the highest health inspection scores in its market and in the entire state of Tennessee.